No sandblasting, grinding or etching required. Covers approximately 25 sq ft of rusted surface. Also available in an economical 1 gallon size or one quart size. 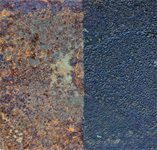 Quick and easy-to-use, Rust Converter Aerosol formula stops rust on iron and steel surfaces and converts it into a black coating that seals out moisture and protects against future corrosion. No brushes, rollers or clean up necessary with the easy-to-apply aersosol spray. The converted rust acts as a primer and can be painted over with an oil-based top-coat. To use, simply remove any loose rust from the surface with a wire brush. Apply several thin coats of Rust Converter Aerosol and allow to cure completely (typically 48 hours) before painting. If the item will be outdoors, we recommend an oil-based paint topcoat for long-term protection. If the item will be inside, a top-coat is optional. One aerosol can covers approximately 25 square feet of rusted metal. Porous and irregular surfaces will require a heavier application rate. 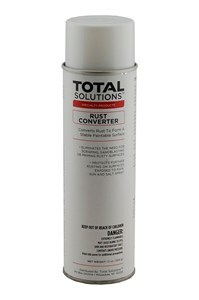 Rust Converter Aerosol has a one year shelf life. Detailed instructions are provided on the can. 13 oz. aerosol can. Made in the USA. How does it work? Rust Converter, a water-based primer, contains two active ingredients: Tannic acid and an organic polymer. The first ingredient, tannic acid, reacts with iron oxide (rust) and chemically converts it to iron tannate, a dark-colored stable material. Tannins are a group of water- and alcohol-soluble natural products extracted from fruits, trees and grasses. The second active ingredient, 2-Butoxyethanol, is an organic polymer that provides a protective primer layer. The overall chemical reaction converts rust into a stable, black protective polymeric coating. We recommend using Rust Converter Aerosol within one year of purchase date.